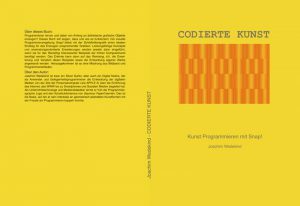 A note to my english speaking visitors: This website is intended to give you an idea about my German book Codierte Kunst (Coded Art). Here you will find a translation of the preface and an extended table of contents. It will give you a first idea of the concept and contents of the book. The book is currently only available in German, but I’m looking for ways to publish it in English … so stay tuned. Is it possible to learn programming and to create aesthetically graphical objects right from the start? This book tries to show that it is possible and explains how. We use the visual programming environment Snap! with its turtle graphics, which allows an easy entry for producing visually pleasing graphics (please note that most if not all examples can also be implemented using Scratch, a similar programming environment, with no or minor changes). With the principle of on-demand learning, powerful concepts and application-oriented extensios are introduced as and when necessary for recoding interesting examples of early computer art. The learned concepts can then be applied to remix artworks, that is the extension and variation of the examples used, and the development of your own new works. 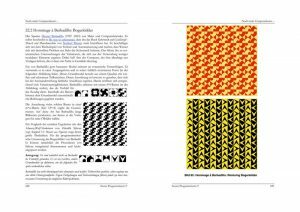 The book covers examples by the pioneers of early computer art and thereby paying homage to works by Georg Nees, Frieder Nake, Michael Noll, Vera Molnar, among many others. Furthermore, connections are made to representatives of other art movements, like Sol LeWitt for concept art or Bridget Riley for Op Art. 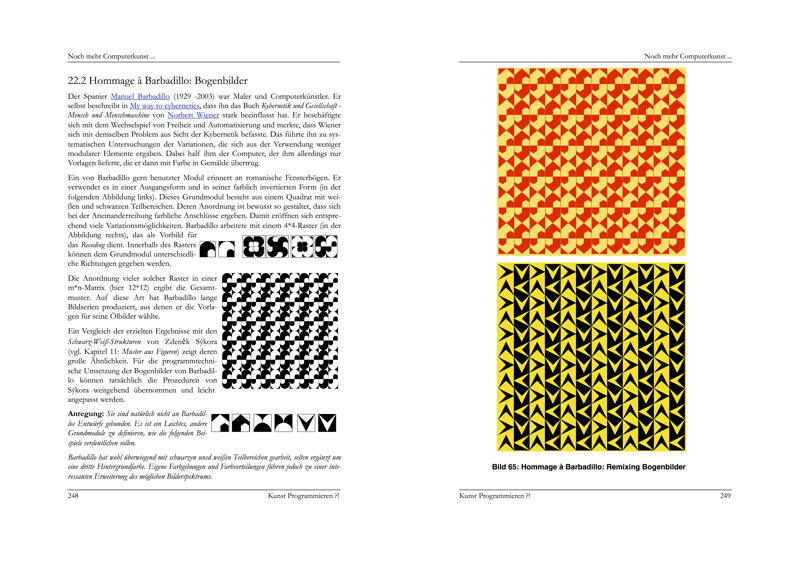 In addition to numerous illustrations alongside the writing, the fully colored print of the book includes 101 images, mostly over whole pages, picturing the results of the recoding and remixing of examples of early computer art. As a result the book is a mixture of picture book and programming guidelines. 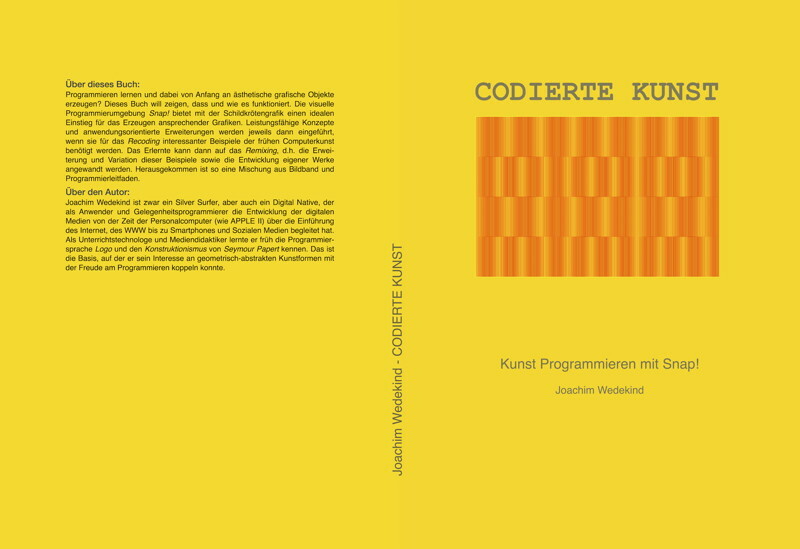 And one more thing: After finishing the writing, layout and corrections, and after the print and distribution work is essentially done, I am happy to present this topic-oriented approach to programming, using the book and the programs. If you are interested in such an opportunity, please contact me via e-mail (the address can be found in the imprint).